We live in a world where no one questions parents for getting help if their child is sick or has a disease, but when your child needs therapy for mental health issues the journey can be hard and very lonely. Although I have my degree in Psychology, I studied the sciences and research side of psychology, not the counseling side. I loved learning about the brain, but I had zero clue about therapy. Then we adopted our youngest son from Ethiopia and knew immediately there were big issues even at only ten months old. We entered a world we knew nothing about, childhood mental health. It’s been six years since we started this journey and along the way I have learned a lot about how to navigate, and survive, the system. I realize systems vary around the world, but I would venture that many of the struggles we face in those systems are fairly universal. Here are a few things I have learned along the way, I hope some of these tips help other families seeking help. 1. No one has all the answers. There is still so much we are learning about the brain and mental health, not to mention brain development and growth. The field is growing and changing constantly. This can be extremely frustrating. I expected the professionals to be able to give me quick and easy answers, I have discovered there really is no such thing in this field. 2. Connections matter. You could find a leading specialist on a specific diagnosis, but if your family and child can not connect with the therapist, healing will be extremely difficult. But connecting with a knowledgeable professional can provide amazing healing and growth. Don’t be afraid to change therapists. It took us five tries until we found someone that could connect with our youngest son. 3. Diagnosis is not straightforward. There is no blood test that can confirm if a person has anxiety or PTSD or ADHD. A single symptom can have many different causes. Plus, diagnosis in children is often heavily based on adult reports of behaviours. This can lead to a lot of confusion and difficulty getting an accurate diagnosis. My oldest has a severe anxiety disorder and is gifted. This often presents like ADHD, but he doesn’t have ADHD. 4. Educate yourself. In this journey you need to be your child’s number one therapist and advocate. Learning as much as you can is important so you can be the strongest you can be in those roles. Join support groups to learn from parents of kids like yours, do research, read books. Gather as much information as you can. 6. Use caution when seeking any assessments, evaluations or treatments. Make sure there is a clear reason and goal for doing it, and that the person that will be conducting the assessments is the best fit for your child. You also need to know where the results of any assessments will be recorded and shared. 7. There are going to be really tough times. Therapy is not a smooth journey. There will be setbacks, there will be treatment programs that won’t work, there will be days when you think you need therapy to survive therapy. This is normal, and also incredibly hard. 8. Get a support team. Find people who understand, withhold judgment, and can help hold you up during those tough times, as well as celebrate the successes. 9. If you need it, seek out professional help for yourself as well. Keeping healthy and a positive mindset is very important. It could be individual counseling, marriage counseling, whatever is needed to help your family stay strong. 10. Everything changes. This is especially true with kids. What doesn’t work when a child is three years old, may be exactly what they need at five years old. Needs change, and it will require a lot of flexibility to change with those needs to ensure healing continues. 11. 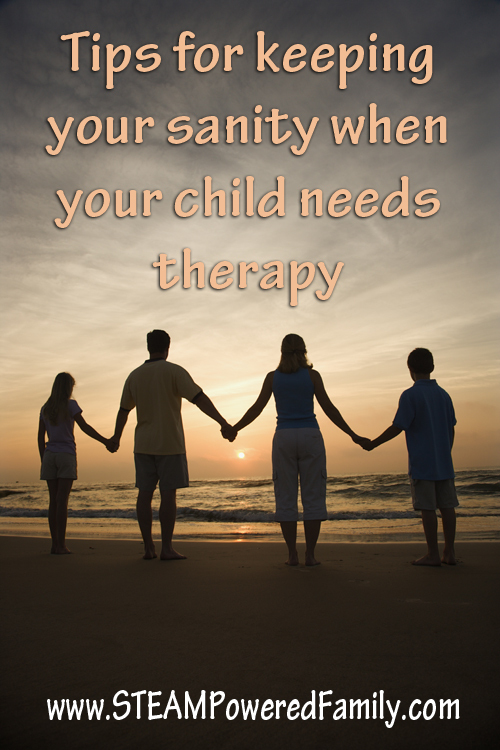 Most of the therapy and healing happens at home, not in the therapists office. This isn’t something you can delegate to a professional or only do during appointment times. Therapeutic parenting will become a way of life. 12. It’s not easy, but it is worth it. We have seen some absolute miracles through therapy. When things get hard I focus on those celebrations, milestones and gains. Small steps over time do add up. So make sure to step back and remember how far you have truly come. Have you ever sought help from a mental health therapist for yourself or your children? Do you have any other tips to share? I definitely agree that it is important to provide a good support group. It helped me a lot when I went to therapy knowing that my wife supported me. I imagine it is even more important when my child is going through the same thing. Something that has helped me here is calming myself down and thinking of therapy visits like visits to the doctor. It is a way to help get better and not something to be scared of.